spade bit formed as a cutter for an ugly router plane. 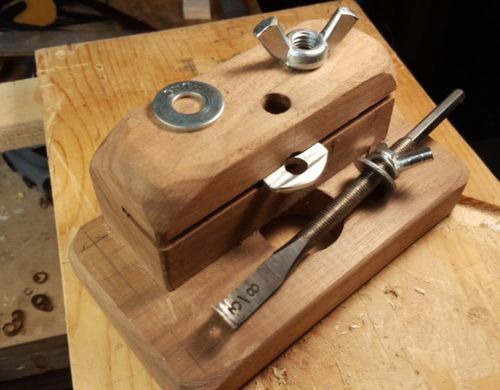 Hello, here’s a 3-hr-made ugly router plane. The picture explains most of the idea. The important thing is that spade bits are a ubiquitous and very inexpensive source of tool steel for small projects such as this, and other tools such as small lathe chisels for fine work. The cutter was made from an old HSS spade bit. I heated it red hot and then let cool slowly. After that, I clamped it in a vise, ground off the point and spurs, and cut threads down the shank to allow depth adjustment. Then, I repositioned it in the vise and bent the tip over to ~80-85 degrees, and then ground it to a rough shape. I chucked it in the drill press at the slowest speed, then reheated it until it no longer attracted a magnet. While it was turning slowly, I quenched the cutter in a tomato paste can of peanut oil, and then tempered it in an oven at ~450F for an hour or so. Then I sharpened it on a 1×30 belt sander with progressively finer silicon carbide belts. While the cutter was tempering in the oven, i ground the tab of a 3/8-16×1-1/2 thumbscrew to a flat uniform thickness, and then drilled a hole through the tab for the cutter’s shank. After that it was just drill, saw, and glue some scraps of walnut to make a plane body that keeps the cutter in position. It’s ugly but the plane works, and after I’m done with another project then i may make it pretty or make a new one with another cutter width – say 1/4” or 5/16”. Nicely done, and it look like you had fun. A little easier source of a cutter for router planes is Allen wrenches. The only problem is the shank changes size for each difference size cutter. But then you wouldn’t need to work with red hot metal and what’s the fun in that? Grinding & honing allen wrenches seems to be much more trouble than they’re worth to me. It’s really not hard to rework the spade bits. I think the re-use of existing stuff is neat but tool steel is not that hard to find nor is it particularly expensive. Wouldn’t it be more cost effective to just buy some scrap tool steel offcuts and fashion that into your blade? The spade bit was immediately at hand and served the purpose. I didn’t need to spend time to look at the computer, or a catalog, nor spend time and money to get into a vehicle and go somewhere – somewhere I might spend an extra hour or two and another $20-50.